Plots: we have plots of 60m2 pine, oak, banana ... with a lot of shade in summer and sunny in winter. With the possibility of hiring part 5 amp electricity. Every plot has water and drainage. Our bungalow for 6 persons are ideal for 4 adults and 2 children because they have a double bed in one bedroom and twin beds in the other room. There is the ability to convert the sofa into a double bed. They are equipped with linens, blankets and pillows. The kitchen has cooking utensils, microwave, a heating and air conditioning, bathroom and parking. It also has a covered porch with tables and chairs. There are no towels, coffee maker, can opener and kitchen scissors. Our bungalows are ideal for 9 people as they have two double bedrooms, a loft with three single beds and the ability to convert the sofa into a double bed. They are equipped with bed linen, blankets and pillows. The kitchen has cooking utensils, microwave, a heating and air conditioning, bathroom and parking. It also has a covered porch with tables and chairs. There are no towels, coffee maker, can opener and kitchen scissors. If you wish to have baby cots and high chairs. Arrivals are from 16h to departures before 11h. 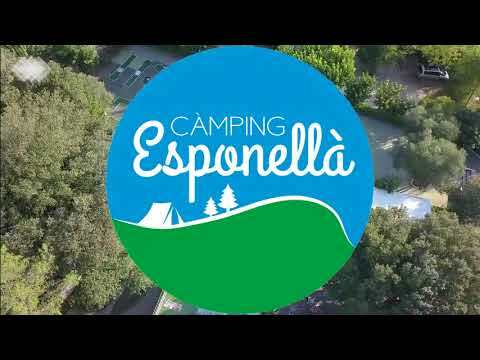 In a place like Camping Esponellà you can not miss any kind of plots! Each of the plots is prepared to offer a comfort zone for all types of campers that are installed there. All of their plots have 5 amps of electricity (if someone needs more, they settle for reception), as well as water. Depending on the trees that surround them, there are plots with more or less shade during the year. For more information, contact reception.